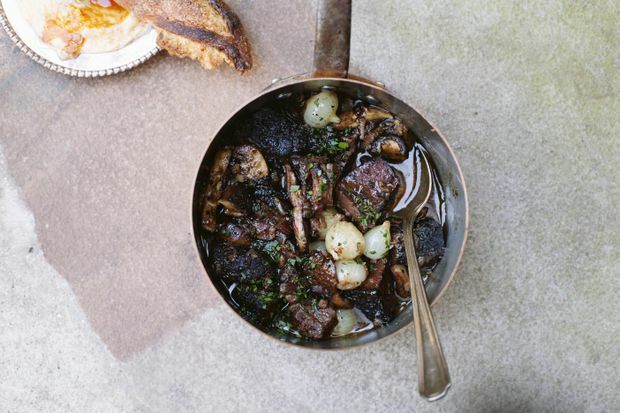 Burnt-end bourguignon, a recipe excerpted from Joe Beef: Surviving the Apocalypse. Separate conversations with Frédéric Morin and David McMillan, chefs and owners of five restaurants in Montreal including Joe Beef, and writer Meredith Erickson, their co-author, illustrate a freakish Vulcan mind-meld. The trio, recently returned to publishing with the extension of 2011’s seminal The Art of Living According to Joe Beef, spoke to me about what they call Book Two. Only a “cookbook of sorts,” as the cover describes, Joe Beef: Surviving the Apocalypse isn’t simply about food. If the first book was a treatise on life lived to the full, the second might be considered the utility manual of how to do so. The book is not about a singular end-of-days, but about all of them; from personal health to environmental sustainability in a restaurant culture of waste, political strife to the long-needed reckoning of mental and sexual harassment within the food industry. Both Morin and McMillan evoke their children as impetus of their shifting perspective; Erickson adds age as well. A look to the larger scope and the idea of what’s next. Not only do the dishes themselves speak to these new priorities – oeufs mayonnaise are a few pages before chaga ghee; the solitary cocktail, a margarita, is balanced by a vitality shake, limeade and a fruit cup dedicated to late restaurateur John Bil – but the sharply witty headnotes often sneak in teachable moments. “A cookbook is an excellent way to convey little, insidious tips for bettering yourself and the planet without sounding [like] Gwyneth Paltrow. You can crack a joke about rabbit that makes people realize the importance of supporting local agriculture,” Morin says. The food swings wildly from the confidently straightforward, such as their Galettes au Sucre de Mammie, a sugar cookie with six ingredients and three steps to make, to the unabashedly involved (see “Beauty’s Special” Saint Honoré, a choux-pastry and whitefish assemblage with piped pastry swans). That said, even the most complicated are written with the succinct language of a working kitchen. It is a particular balance evident in any project from this crew – from building restaurants to stocking a fallout shelter – romance and usefulness in equal measure. Food is but one of their myriad interests. Thus, the book includes digressions on MMA, PBS and secret lakes. Even if detailing criteria for selecting a menu for a Sunday dinner at home, their concern is not so serious that it skirts obsession. To the authors, that would be boring. Book Two conveys a view beyond the table. With photos of friends, employees, heroes, families, the book travels from cottages to farms, their homes and restaurants. It makes space to honour Mohawk history and claim to those lands. It is a book reconciling past and present, and preparing for the future. “I’m also trying to take what’s ours with this book. It’s also a bit of a middle finger in the air. I’ve had, personally, a lot of issue with young cooks who are motivated by Michelin stars, or are motivated by the San Pellegrino awards, or want to be a top world 50 restaurant. A lot of that stinks to me with incredible pretense,” McMillan says. With that in mind, I’ve been cooking from Surviving the Apocalypse in my own preparedness initiative. 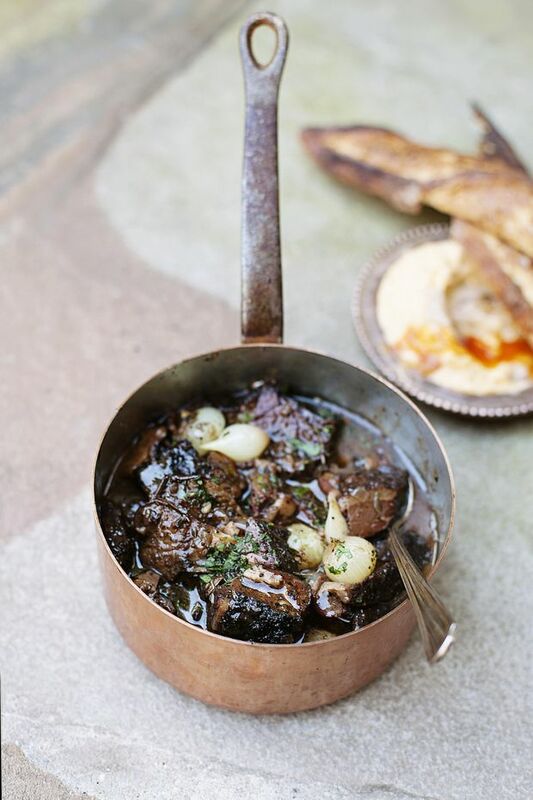 The most recent dish, burnt-end bourguignon, is an expedited version of the French standard. Burnt ends can be either irregular points and edges from a smoked brisket, or fattier off-cuts that a master might not serve on a meat plate. For mine, I went to Brushfire Smoke BBQ, the spinoff restaurant from Niagara Oast House Brewers in Niagara-on-the-Lake, Ont. Their coffee-rubbed briskets are smoked over a combination of maple and local fruit wood for 14 hours, and sprayed with the brewery’s Barn Raiser APA. If purchasing yours, ask for such preparation details to inform the choice of wine for the braise. Morin advises against overdone burnt ends, which lack texture. To compensate, he suggests slipping chunked brisket into the pot as well. The stew is simple: bacon and aromatics into a heavy pot, bathed in wine and stock, ends into that, braised for an hour. I served the bourguignon with toasted baguette slathered with all-dressed compound butter, a hidden gem from the book. It’s a barbecue-sweet and salt-and-vinegar-sharp spread of crushed chips, hot sauce and softened butter. On a cold January Saturday, offer a barely dressed salad of bitter greens, and an apple tart to finish. Burnt ends can be either irregular points and edges from a smoked brisket, or fattier off-cuts that a master might not serve on a meat plate. In a deep sauté pan or large Dutch oven over medium-high heat, sweat the bacon until it renders all its fat, then add the onion and cook until translucent. Add the thyme, garlic and pepper, cooking for a minute. Add the flour, stirring well, then pour in the wine, vinegar and veal stock, stirring to combine. Add the salted butter and stir in the brisket ends and pearl onions. Bring to a simmer and cover tightly with aluminum foil or the Dutch oven’s lid and braise in the oven for 1 hour, giving it a stir and checking on the braising liquid at the halfway mark. Adjust the seasoning to taste then stir in the mushrooms and the parsley and serve. Recipe excerpted from Joe Beef: Surviving the Apocalypse: Another Cookbook of Sorts by Frederic Morin, David McMillan and Meredith Erickson. Copyright © 2018 Frederic Morin, David McMillan and Meredith Erickson. Published by Appetite by Random House, a division of Penguin Random House Canada Limited. Reproduced by arrangement with the Publisher. All rights reserved.